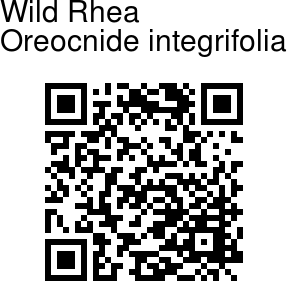 Wild Rhea is a large bush or a small tree up to 8 m tall. Bark is brownish, warty, blaze pinkish. Young branchlets are obtusely angular, sparsely white velvety. Alternately spiral arranged leaves are clustered at twig ends. Stipules are lance-shaped, falling off leaving a scar. Leaf stalk is 1-3.7 cm long. Leaf blade is 10-20 cm long, 2.5-6.4 cm braod, narrow-elliptic to inverted- lanceshaped, apex caudate or caudate-acuminate, base pointed to wedge- shaped, margin entire or toothed towards the tip. 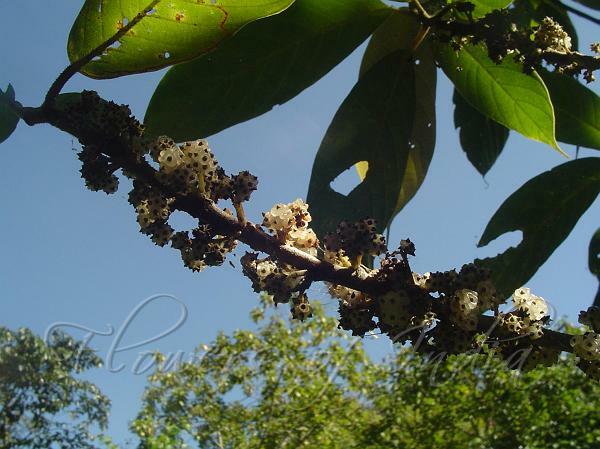 Flowers are borne in flat-topped clusters of heads, about 0.4 cm across, axillary or from leaf scars. Flowers are unisexual, monoecious or dioecious, nearly stalkless. Wild Rhea is found in NE India, Myanmar and Sri Lanka, in the Western Ghats - South and Central Sahyadris, at altitudes of 200-1400 m. Flowering: March-May. Identification credit: Navendu Pāgé, Vijaysankar Raman Photographed in Mizoram & Sourinee, Mirik.